A previously accurate Apple source has told 9to5Mac some interesting information regarding what 2011 holds for the iPhone and Apple’s popular FaceTime video chat service. The next generation iPhone has reached the final testing stage (aka “AP” stage [Thanks, Chronic!]) and is now being carried around by high level Apple and carrier executives. Although this has been assumed since the no-iPhone-at-WWDC-rumors broke, the current plan is for a September launch for the next-generation iPhone. Apple and Verizon have yet to strike a deal regarding FaceTime over 3G for the Verizon network. Keep in mind that 3G and 4G aren’t the same thing. < Don’t read into that too much. Or maybe do. Apple and Verizon are still working out kinks regarding support for iOS 5’s over-the-air updates, which we broke the news about, so carrier support may or may not be delayed past fall 2011. While snooping around the iOS 5.0 SDK we located references to “N94” and “N93.” These are internal code names for two unreleased iPhone models. As we have already told you, the N94 is an iPhone 4 with an A5 dual-core processor and it is likely the device that a small group of elite iOS app developers got their hands on in late April. The N93 is likely a carrier variation of the N94. We aren’t too sure what this variation could be, as the only time a model number varied based on a carrier in iPhone history was with the iPhone 4: GSM is N90 and CDMA is N92. Verizon already leaked that the next iPhone features a GSM+CDMA chip, so perhaps the N93 or N94 is the Sprint model we told you about – or T-Mobile. Oh, and one final thing… according to the iOS SDK, and the same snooping we used to break the news that the iPad 2 will feature the same cameras as the fourth-generation iPod touch, it looks like the next-generation iPhone will keep the 5 megapixel sensor found on the iPhone 4. Many of us were expected a boost to 8 megapixels after Seth broke the news about Sony CEO’s comments on Sony making cameras for Apple. 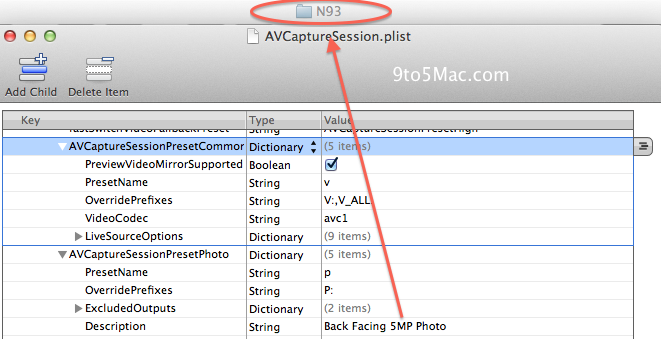 Perhaps Apple never updated the SDK files, though, or maybe the N94 and N93 are scrapped devices all together. Maybe Apple took the extra three months to whip up something totally new: not just an iPhone 4 with an A5 to boot. P.S: We are expecting some more intelligence soon, so stay tuned!